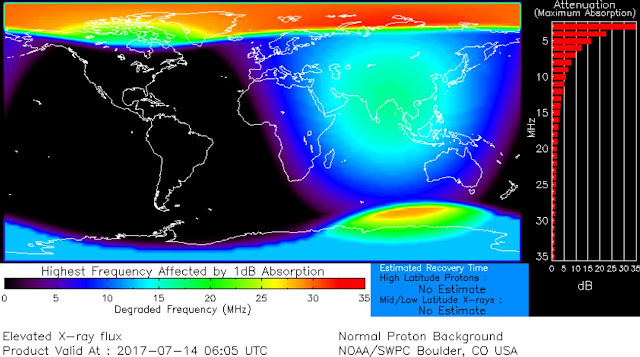 Shortwave radio blackouts were subsequently observed over the Pacific Ocean and especially around the Arctic Circle. This map from NOAA shows the affected geographic regions. a powerful and long-lasting M2-class solar flare. It is the most powerful solar flare since a M5.8 ejection way back on the 3rd of April this year. According to Spaceweather.com, the explosion persisted for more than two hours, producing a sustained fusillade of X-rays and energetic protons that ionized the upper layers of Earth's atmosphere. Of even greater interest is the coronal mass ejection (CME). This expanding cloud will likely reach our planet on July 16th, possibly sparking geomagnetic storms and high-latitude auroras when it arrives. Stay tuned for improved predictions as NOAA analysts model the trajectory and potency of the incoming CME.